On January 17th, ArtsWestchester, in collaboration with Long Island Traditions will open a two-part exhibition on the occupational tradition of boat building on the Hudson and Long Island Sound. Our region is bounded by waterways that have always provided transportation and recreation. The building and repair of boats and ships of all sizes has been a vital part of occupational culture from the dugout canoes of the native Linape peoples through the heyday of 19th Century Hudson River sloops and steamboats, to the building and repair of fishing and pleasure boats. 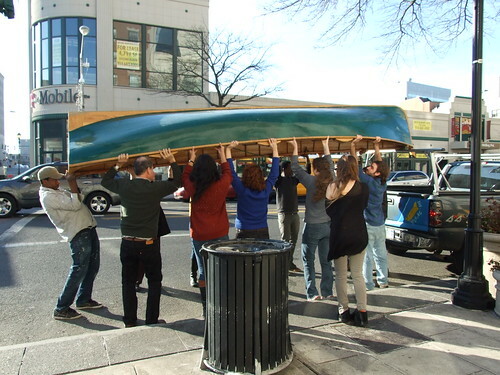 While the construction of boats has changed dramatically from wood over frame methods to steel, aluminum and fiberglass, the art of traditional boat building is being revived at educational key sites from Cold Spring to the Bronx, and larger boats are still being built at the Derecktor Shipyard in the Mamaroneck. In 2011 ArtsWestchester entered into a partnership with Long Island Traditions, our sister folk arts program in Port Washington, to research and present the work of current and recent boat builders in our region and vernacular architecture and at longtime boatyards where boats have been built and repaired. This project is made possible with a grant from the National Endowment for the Arts, the New York State Council on the Humanities and the New York State Council on the Arts. The exhibition will feature the photography, text panel, and audio visual profiles from interviews with local craftsmen, photographs of examples of their work, displays of tools, materials and half a dozen completed water craft built at educational programs of our region.